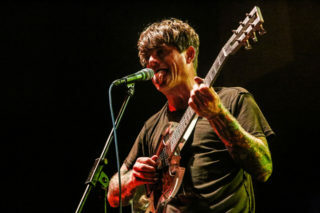 John Dwyer is a one-man music industry. 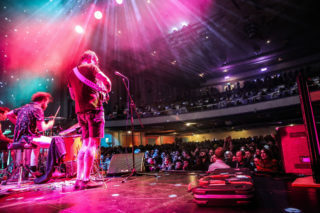 In addition to helming the twenty-albums-in-twenty-years band Oh Sees, he is one of the co-founders and runners of the prolific Bay Area label Castle Face Records. But even that’s not enough for him, so he has assembled as much of the Castle Face roster as can fit on one bill and shipped them to the UK for a brief, oversubscribed tour. Tonight, even the ‘Beast From The East’ lashing at the door can’t keep devotees away. The first of the evening’s five sets comes from twenty year veteran of the scene Kelley Stoltz, a San Francisco native but relatively new addition to the Castle Face family. His songs are defined by melodic, story-building writing and regularly feature handsome guitar licks, more than enough to win over an impressively busy early crowd. Los Angeles’ Flat Worms raise the pulse as soon as they hit their first chord, their youthful punk attack the true early pace-setter for the night. 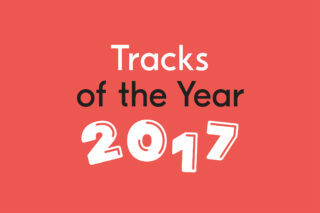 Each track is a burst of sharp, compressed energy, economical and lean, and most of their self-titled debut album gets an airing. Even so, they barely fill their 30 minute slot, such is the pace of life in Flat Worms. By now, the crowd is fizzing, treating every act as they would a headliner. Male Gaze are next, although circumstances require that their numbers be filled out by Brighton band Skinny Milk. 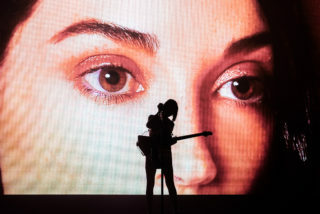 With that in mind, it is remarkable that they perform as cohesively as they do, but nevertheless their material is more static and leaves less room for improvisation than the bands around them. It would not quite be fair to say that intensity levels dip, but they do briefly return to normality. Intensity of a very different kind is in order with Once & Future Band, who draw from an entirely different musical history than the garage rock staples that dominate Castle Face. Genesis and Steely Dan are among the touchstones for their languid, gloriously indulgent set, in which they embrace ludicrously catchy melodies in a way that would make less courageous bands cringe. They climax with a 15 minute track from their soon-to-be-re-released EP ‘Brain’ that is mesmerisingly progtastic. 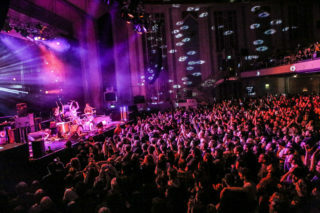 It leaves a few of the psych heads in attendance a little perplexed, but sublime nonetheless. 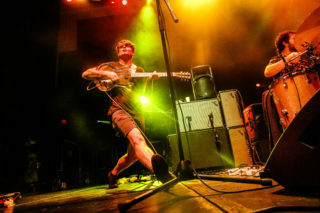 It falls on the Oh Sees to bring a monster night to its final heights. “Tonight’s set is dedicated to Mark E. Smith,” are the first words out of Dwyer’s mouth, a surefire crowd-winner in Manchester, before exploding into ‘Static God’ from 2017’s Orc. Their current lineup features the double drumming pair of Dan Rincon and Paul Quattrone, guaranteeing an unwavering, pulverising core. More remarkable is that there is only one guitarist, such is the sheer weight of the electric squall that fills the air. No guitarist of his generation wields Dwyer’s power; depending on how the light catches him, he appears to embody a different hero, whether Ron Asheton, J. Mascis or Greg Cartwright. 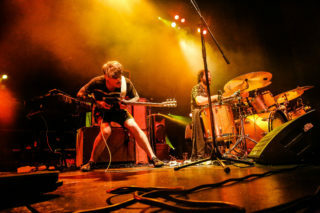 To stop playing is to stop breathing for the Oh Sees and it rarely happens for their 90 minutes on stage. One breakneck, destructive song follows another as the boiling point in the crowd finally spills over and bodies start to fly in all directions. This is live music that dances perpetually on the edge of sonic boom. It almost seems cruel to end it, but they do finish with an extended version of 2011’s ‘Contraption/Soul Desert’, a track they would still be playing as you read this if they had their way. It is rare indeed for a single show to capture a scene during its peak years, but tonight Castle Face Records have gifted us a thrilling, vibrant snapshot of the state of garage rock in 2018. With John Dwyer at the helm, the future is in safe hands too.